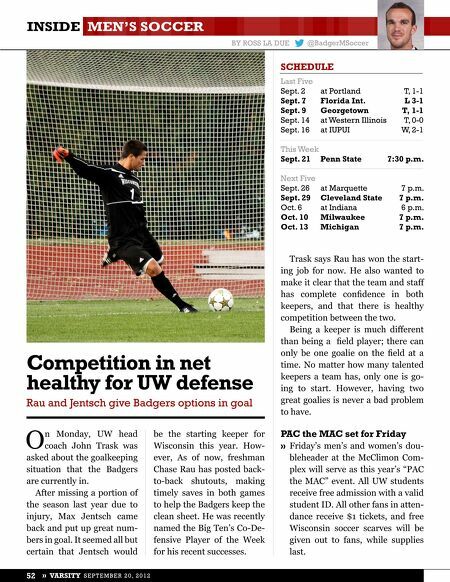 INSIDE MEN'S SOCCER BY ROSS LA DUE @BadgerMSoccer SCHEDULE Last Five Sept. 2 Sept. 7 at Portland Florida Int. Sept. 9 Georgetown Sept. 14 at Western Illinois Sept. 16 at IUPUI This Week Sept. 21 Penn State Next Five Sept. 26 at Marquette at Indiana Oct. 10 Milwaukee Oct. 13 Michigan T, 1-1 L 3-1 T, 1-1 T, 0-0 W, 2-1 7:30 p.m. Sept. 29 Cleveland State 7 p.m. Oct. 6 7 p.m. 7 p.m. Trask says Rau has won the start- ing job for now. He also wanted to make it clear that the team and staff has complete confidence in both keepers, and that there is healthy competition between the two. Being a keeper is much different Competition in net O n Monday, UW head coach John Trask was asked about the goalkeeping situation that the Badgers are currently in. After missing a portion of the season last year due to injury, Max Jentsch came back and put up great num- bers in goal. It seemed all but certain that Jentsch would 52 » VARSITY SEPTEMBER 20, 2012 healthy for UW defense Rau and Jentsch give Badgers options in goal be the starting keeper for Wisconsin this year. How- ever, As of now, freshman Chase Rau has posted back- to-back shutouts, making timely saves in both games to help the Badgers keep the clean sheet. He was recently named the Big Ten's Co-De- fensive Player of the Week for his recent successes. than being a field player; there can only be one goalie on the field at a time. No matter how many talented keepers a team has, only one is go- ing to start. However, having two great goalies is never a bad problem to have. PAC the MAC set for Friday » Friday's men's and women's dou- bleheader at the McClimon Com- plex will serve as this year's "PAC the MAC" event. All UW students receive free admission with a valid student ID. All other fans in atten- dance receive $1 tickets, and free Wisconsin soccer scarves will be given out to fans, while supplies last. 7 p.m. 6 p.m.